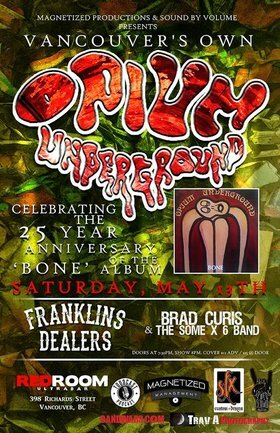 Magnetized Productions & Sound By Volume Presents: Vancouver's own OPIUM UNDERGROUND celebrating the 25 Year Anniversary of the ‘BONE’ album w/ Franklins Dealers / Brad Curtis and The Some x 6 Band. Saturday, May 13th at Red Room Ultra Bar, 398 Richards Street, Vancouver, BC. Doors at 7:30pm, Show 8pm. Cover $12 Adv / $15 @ Door. Formed in 1991 OPIUM UNDERGROUND was one of Vancouver's pre-eminent buzz bands through the early 90's. Out of the gate they proved their brand of music and high energy live performances could turn some heads. 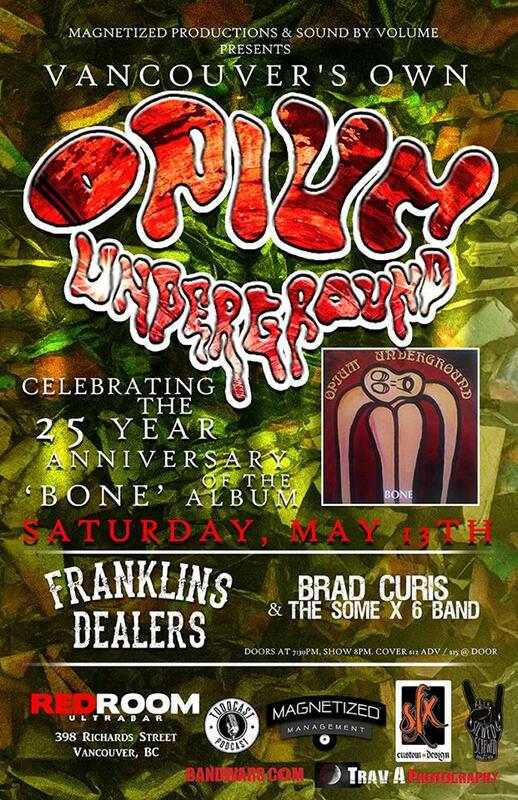 Formed by guitar player Darcy Laing, vocalist Mylk Shaflik, bass player Jason Burwash, and drummer Kevin Lewington, OPIUM UNDERGROUND, played extensively through the early 1990's locally and nationally, both headlining and opening for major international artists. Three months in OPIUM UNDERGROUND recorded their first 3 song demo and set out to LA to shop the product with some interest. The release of BONE which included the three original demo tracks plus singles Many Days and Letter both supported by videos on MuchMusic and other music stations. Radio support followed with OPIUM UNDERGROUND winning best live act in Vancouver's SEEDS completion and being featured on DEMO VISION Project Discovery's National television broadcast. The single Ain't Got the Time continued to receive air play for many years after the album’s release with grass roots support. In 1993 Todd Lasage replaced Kevin Lewington on drums and stayed with the band until the breakup in late 1996. Myk Shaflik went on to play with SOUL DUST and form Vancouver's CATAPULT, which included Jason Burwash on Bass of a short time. CATAPULT remained playing until 2011. Myk is now working on a project Called TARNISH BY GREY. Darcy Laing relocated back to Manitoba and formed PEPPER LAING & THE LONE STAR KILLERS and they continue to play. Jason Burwash continued playing and fronting LUSH GUPPIE and DABB through the early to late 2000’s. In 2003 Todd Lesage formed alternative country group AFTER ALL THESE YEARS in Manitoba and continues playing in projects in the central Canada..